So, this morning my lovely friend Tara texted me at 7:40 saying there was an epic estate sale going on. Now, normally I am a good employee and I would have said, "Tara, I just can't go. I have to get to work." But then I called her and she said I could go to this website and look at pictures of what all was there. And I immediately threw on some clothes and left for the sale. Holy cow! I have never seen this much actual antique stuff in a Titusville sale before and it was really nice pieces at good prices. I was probably a good thing that I had to go to work or who knows how much I would have spent. So, what was the main thing I spotted in the photos that made me beeline out of my bed so early? This rather unassuming and (let's face it) mold-covered box. What could be inside? 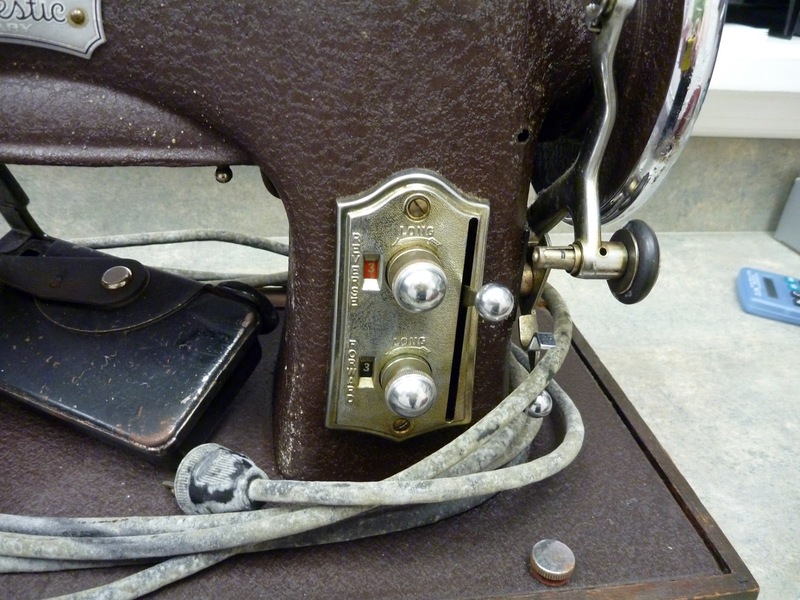 Why, it's a sewing machine! 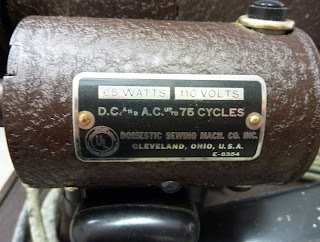 A Domestic Rotary machine to be exact :) I've looked it up and it was made in 1947. 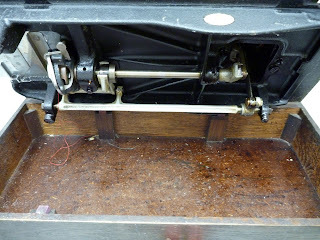 Even though the box and cord have a lot of mold, the machine itself seems to be perfectly fine. It's well oiled and nothing is jammed. It even has a light bulb under the label there. That thread was already on it and threaded so it seems like it was used not all that long ago. This is where you adjust the stitch length and whatnot. And the inside workings look fantastic! I will confess, I was afraid I would open up the bottom of the machine and find something nasty but look how clean it is in there! Here's the model number and such. So, why did I suddenly decide to purchase this machine? Well, I am always looking for an old treadle style machine (which they did have but it was missing the foot pedal) and so I've wound up learning a lot about pricing on old machines. If I was to try to get this baby through Etsy or Craigslist, it would be at least $50. People tend to see the style of it and immediately slap at least a $50 price tag on it just because it's kitschy. 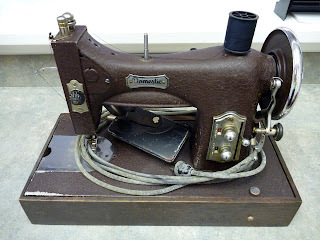 I snagged this guy for just $35 :) I know I will have to do a thorough cleaning and I'll take it into a shop to get an overhaul (not to mention I don't know if the electricity still works), but I would have had to do that with any antique machine so I'm ok with that. Anyway, I also grabbed a handful of other nice items. I bought a tin and a bag full of random notions and machine parts. The tin included that ruffle foot and there are buttons and all kinds of things in there. The bag is mostly full of wooden spools of thread but there is a package of boning and a bunch of other things too. I haven't even had a chance to look through it all. 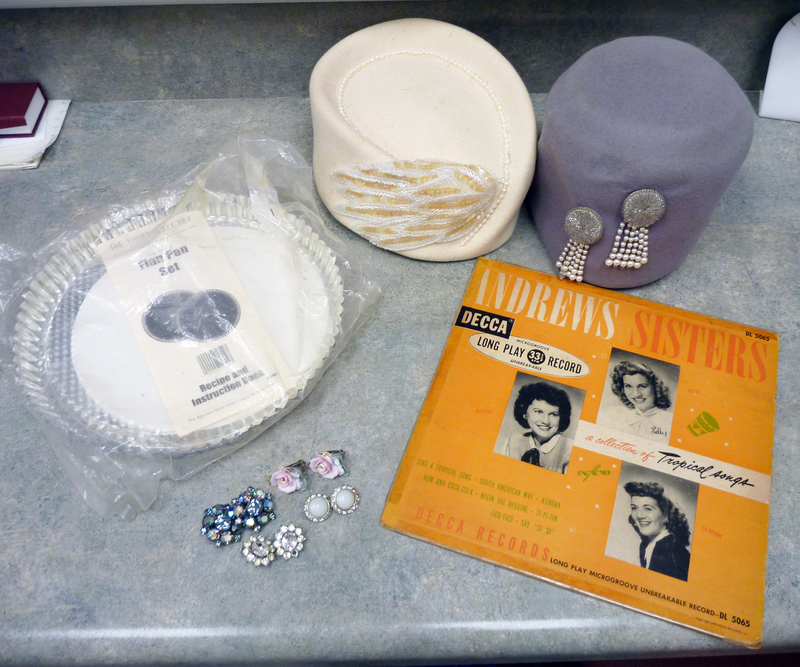 I also grabbed those two wool hats - the cream one is probably 50s and the gray is certainly early 40s or possibly late 30s. I grabbed a bag with 4 pairs of costume earrings, an Andres Sisters record and a new-in-the-package Pampered Chef Flan Pan Set (it was only $1). Also, I got one of those plastic drawer unit things that holds little parts and pieces like you would see in a hardware store. It has a few trims and things in it but I mostly just wanted the drawers to put my sewing stuff in. So, I had a very exciting morning :) And all that before I even went to work!